Nimh is the project of Giuseppe Verticchio, who is active in the ambient/electronic fields for about a decade. I have not listened to his music before, but I've heard good things about his release on the Taalem label. "Frozen" was already recorded in 2000, but now is re-released in a new version. 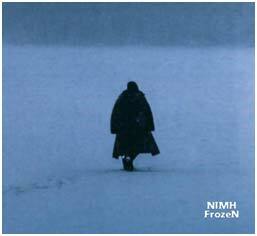 The cover is nice and appropriate, you see a solitary figure wandering ina blue snowy landscape. This perfectly matches the music, which is rather cold and minimal. The CD-R consists of one long track, lasting for an hour. This cold soundscape is based on slow drones, which sometimes swell a little in intensity and then get more quiet again. Not too much happens in the music, it never get's very obtrusive. Towards the end the volume of the low machine-like frequencies gets louder, and the effect of the deep drones becomes more ritual. Listening with full attention to this CD-R for an hour is rather intensive, despite (or perhaps because of) the fact that there are only gradual changes in sound. But certainly a skilfully sculpted long cold wave of glacial sound. Frozen music indeed.